Serving WNY for over 40 years, specializing in general contracting, metal buildings, concrete and carpentry work for new construction, additions, and renovations. Private owners, public entities, and architects want general contractors and construction companies who deliver what is expected…who meet deadlines…and who stay within budget. 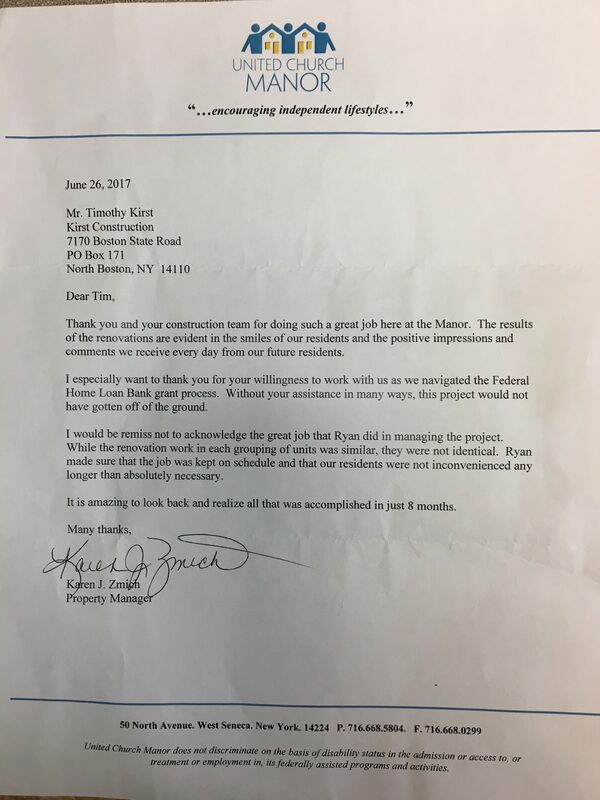 Kirst Construction built its reputation as a respected, sought after construction firm by delivering just that. Kirst Construction offers Buffalo, NY and its surrounding areas a complete line of construction services to meet all of your needs including general contracting from start to finish, building permits, to site development, through final landscaping. We deliver what we promise when we promise it! Celebrating 40 years of business and continuing to move forward and expand as the next generation takes the helm. Carl Kirst began the company with his sons, Don and Ken, as a small residential contractor doing renovations and deck work. Soon they began to hire more employees and the framework of a commercial construction company emerged. Priding themselves on quality, safety, commitment to excellence and timely job completion, Kirst began to grow.